With the government unable to provide social security to all its citizens, most self-employed groups face a huge challenge of protecting their future. They have turned to gold the most liquid, portable, and easy to transfer asset. R. Vaidyanathan says the self-employed must mount pressure on the government to understand the role of gold. It is not the Indian woman who is naive, but the government that is insensitive to the emerging old-age security crisis. IN ANY seminar on the Indian economy, the discussion invariably turns to the savings in the system. The savings rate — the percentage of savings to national income — was 22-23 per cent in the last decade. Contrast this to the savings rate of less than 10 per cent in the 1960s. This is taken note of, and then the experts (coincidentally most of them are from Delhi) bombastically conclude that savings rate should increase some more to give a further boost to the economy. Then they criticise the unproductive investments undertaken by households in buying gold, which is substantial and increasing over years. 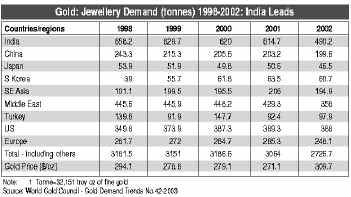 India is one of the largest buyers of gold in the world. More than 90 per cent of this is for jewellery purposes. Table 1 gives the purchase of gold for jewellery by different countries. In the past, Indian demand was more than 20 per cent of global consumption. Recently, the attraction of smuggling has come down due to liberalised import policy. Incidentally, domestic production of gold is very negligible, running into a few tonnes. The purchases made in Saudi Arabia and Gulf states is also mostly by people of Indian origin and to that extent the demand by “Indians” is much larger. What is bought in Gulf states this year by the NRIs (non-resident Indians) will reach here may be in a year or so. At an average price of, say, Rs 4500 for ten grams, we can estimate that more than Rs 22,000 crore has been spent in buying gold last year by Indian households, which is much larger than the aggregate capital raised from the stock market. The purchase of gold by households is not treated as savings in our statistics. It is treated, as consumption by households which is curious as households treat purchase of gold as “investments” whatever the economists in government may think. The “experts” are more or less unanimous that households, particularly women, are doing “unproductive” investments in gold jewellery. They would rather households invested in government bonds which can be used to pay salaries for government employees (the most “productive” activity). But why do households invest in gold? It is not for the return but for security. Gold is the major social security for large number of Indian households which do not have any social security at all. The OASIS (Dave Committee) report indicates that nearly 90 per cent of the India’s workforce, particularly the self-employed, is not covered by any retirement scheme that enables savings for economic security during old age (OASIS report page 6). The problem is more acute for the wives of these self-employed, as they do not have any independent access to income or savings. Even if they work, it is used for current consumption. In the poorer segments, a good portion of the income of the man could be used for drinking, gambling, etc., and hence not much left at old age. The joint family system is breaking down and so the traditional support models are getting weakened. Under the circumstances, it is but natural that the Indian woman would like to own some assets which are useful in old age, or in case of any other eventuality. Real-estate is relatively costly, not divisible and not portable. Gold ornaments are portable and divisible. A chain can be converted into two bangles and also one can have smallest nose ring or ear stud unlike land. Transfer of ownership is also very easy. In the case of gold ornaments one can say that possession is ownership. In other words, if a mother removes her chain and gives it to her daughter then it belongs to the latter by tradition. One can get loan against gold by pledging it with a moneylender any time of the day or night, seven days of the week. The millions of moneylenders are actually the ATM (All Time Money) of our country, as they act as money vendors with a personal touch too. In other words gold represents the most liquid form of asset in India. One can also say that gold is the most politically correct metal, which can be owned. In traditional Indian families, sometimes, shares or fixed deposits are disposed without the knowledge of the housewife. But gold is always sold with the concurrence of the housewife. Of course, if it is on her body then it cannot be disposed off without her knowledge. The so-called superstition pertaining to not removing the Mangal Sutra till the death of the husband is an insurance protection to the woman against rapacious relatives and children. It is assumed that the gold ornaments will work as social security for her in case of major emergency or after the death of the head of the household. The Bollywood blockbusters of yesteryear would invariably have a scene where the heroine removes her bangles or chain to be pledged for the benefit of her ailing husband and it did reflect the ground reality better than the views of experts. Hence, gold is the most liquid, portable, easy to transfer, act as social security and insurance for the middle- and low-income group women. The Total Stock of Gold is estimated at 10,000-15,000 tonnes (by the World Gold Council; WGC) which may be an underestimate Credit delivery mechanism to the P&P sector can be enhanced using this asset. This we will see later. At this juncture it is useful, to understand some of the recent developments which are important for Indian households. Many governments in Europe are unloading their stock in the market. Gold is not treated as a unit of measure of safety or as a hedging instrument. Gold standard has come to an end and with the development of derivative markets it has lost its earlier attraction for hedging. As the largest buyer of this metal in the world, India should play an active role in the international market and leverage our position to shape policies pertaining to gold. Any large buyer of a commodity, say, oil or coffee or zinc or maize wants to, and does, have a say in the accelerated disposal of that commodity in the world market. What does India do? Nothing. Is our government, then, not concerned about the welfare of the people but only about some ideological shibboleth? Why is it so? It is because there is a considerable dis-connect between the government and the middle-class. The planners and policy-makers are either the socialist type or globalising metropolitan elites. The socialist experts feel that the middle-class or petite bourgeois is naive to invest in unproductive assets instead of joining the working class in the struggle to get social security for all. This did not happen and even the proletariat opted to buy gold having little faith in the government (of any variety) providing any security at old age. The globalising metropolitan elites feel that the middle-class is foolish in investing in gold since the “experts like them” have defined it to be un-productive. They are concerned about reforming the government pension system which is under severe strain as both the Central and State governments are broke. In such a situation, the most entrepreneurial and hard working, self-employed groups of the P&P sector are facing a huge challenge to protect their future. Their position is that of a nut caught in the nutcracker with the socialists and globalisers acting as the two arms. The self- employed must mount pressure on the government to understand the role of gold. It is not the Indian woman who is naive or foolish, but the government which is insensitive and ignorant to the emerging old-age security crisis. In the context of `Digital Cash’ becoming more active, the number of transactions may rise to trillions and the number of trans-border entities issuing them will also increase. This would be more so with increased outsourcing activities. Since “Digi-Cash” does not have any sovereign guarantee, the role of gold as a medium of exchange and as an underlying standard will increase. As the monetary transactions in the net-based world expand, the concern for the underlying lack of “Sovereign Guarantee” should be highlighted. In the context of a possible decline of the US Dollar, this may not be very difficult to visualise. Along with this, a campaign should be launched by India to bring gold as standard of security (if not as an exchange) and this may enormously help the millions of self-employed in India who own this asset and who have to take care of themselves in the coming decades.